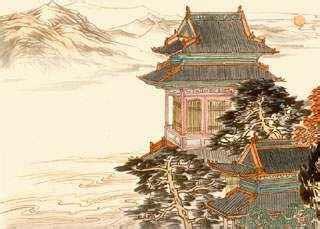 Wang Zhihuan is a famous poet from the Tang Dynasty and this is his most well-known poem. Many artists have painted images of the Stork Tower and mountains to accompany the poem. Huáng hé rù hǎi liú. Gèng shàng yì céng lóu. Along the mountains set the last sun rays. Towards the sea the Yellow River flows. You must ascend one more story of the tower.